Part of a colossus at the bottom of the temple. On the sight of Ramses the 2nd temple. General view of the temple. Decorated ceiling of the temple. Pharaohs' statues at the temple. Some broken statues at the temple. Wall relief representing offerings to the king. Ramses II had one of the longest reigns in Egyptian history, he ruled for 67 years and built more numerous monuments, of greater size, than any other pharaoh. 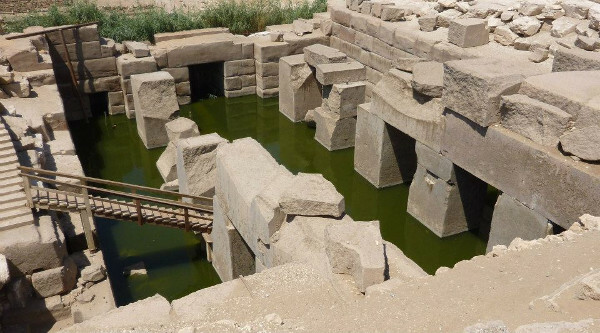 He repeated in huge and detailed relief his victory during the Battle of Kadesh in the 5th year of his reign. 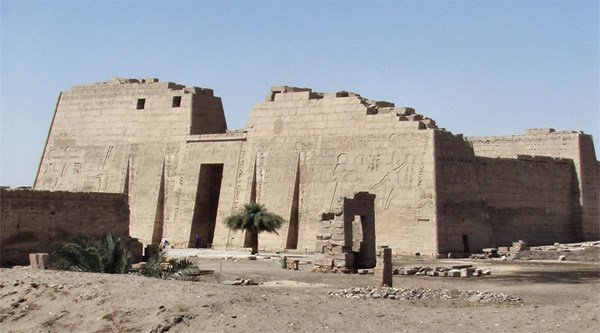 The Ramesseum is the memorial temple of the great warrior king Ramesses II. 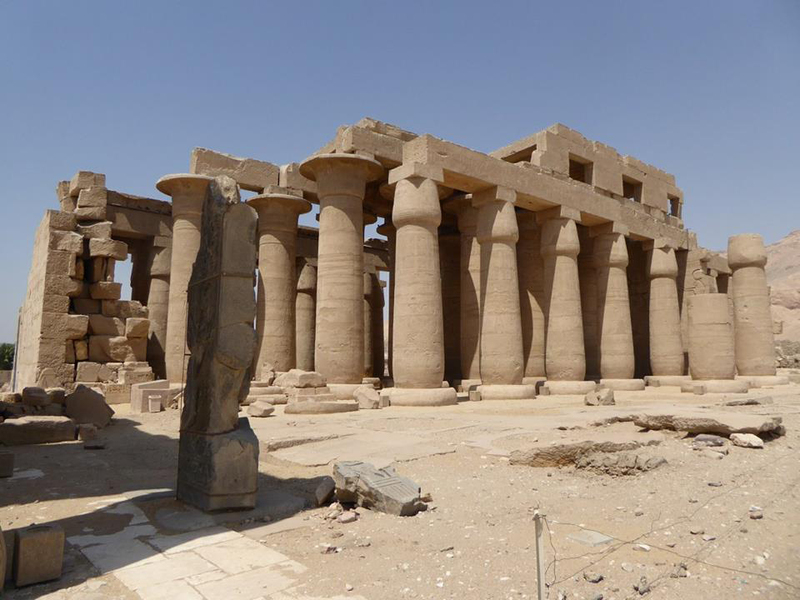 One of the largest and best-preserved of these temples, this "Mansion of Millions of Years" contains the fallen colossus that inspired Percy Bysshe Shelleys poem, Ozymandias. Scenes from the king's great Battle of Qadesh (in which only Ramesses II's personal valor saved the Egyptians from ignominious defeat at the hands of the Hittites) adorn the first and second pylons. The king's successful campaign against the Syrian fortress of Dapur is illustrated in the Hypostyle hall, along with images of the king receiving his regalia from the god Amun-Re. The plan of the temple is typical for the New Kingdom. Behind the pylons are courts, and then a pillared hall filled with columns in the form of marsh plants, finally a bark shrine for the sacred boat of the god and the inner sanctuary. The floor rises and the ceiling drops as one enters the temple further, to evoke the moment in which the Egyptian universe was created from the primeval mound that rose from the endless waters of the flood. Both towers of the Entrance Pylon are badly damaged. The inside of the northern tower has scenes of the Egyptian camp and the southern tower scenes of the battle. Towards the south-eastern corner of the First Court lie the remains of what was once the biggest colossus of the pharaoh and, without doubt, one of the most enormous pieces of stone ever fashioned. The remains of this perfectly sculpted and polished granite statue include the chest, upper arm and foot. Careful measurements have been made and it is estimated that the statue?s total height must have been over seventeen metres, and its weight over a thousand tons. 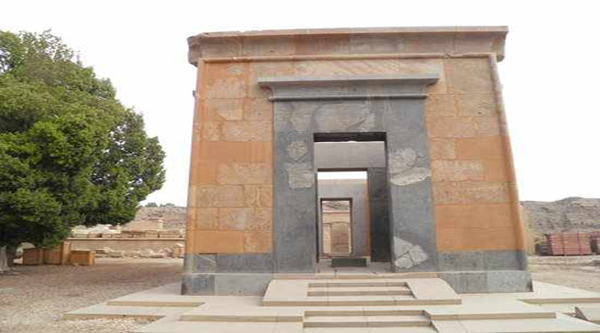 It was transported from quarries of Aswan in one piece. The Second court had colonnade on all four sides and a terrace to the rear. On each side of the central stairway leading to the terrace were monoliths of the king. 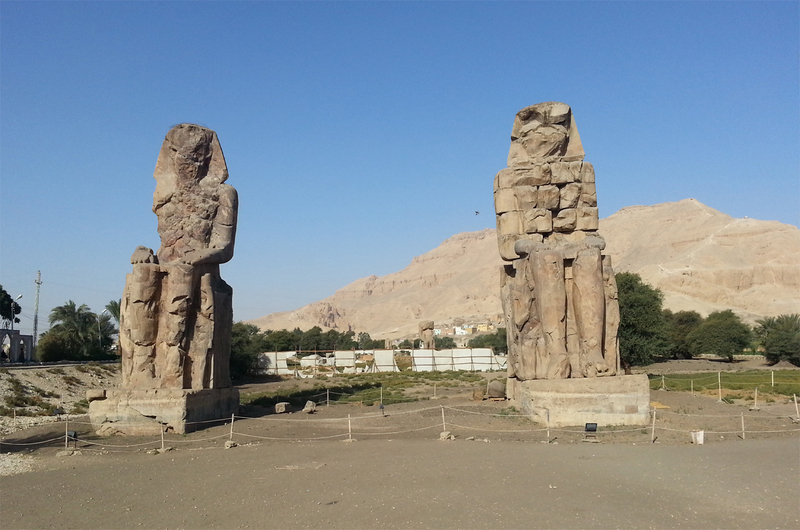 Facing the court were still more statues of Ramses II backed by Osiride pillars. The representation on the shafts of the columns shows him sacrificing to the deities. 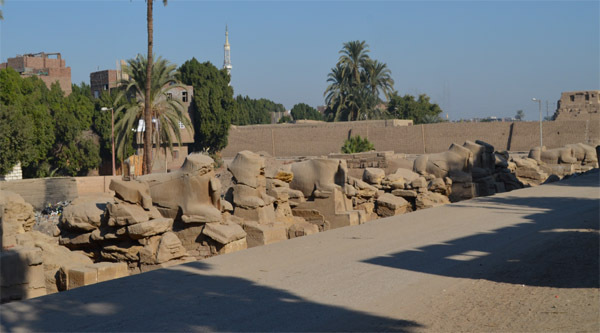 To the right of doorway we find more scenes of the Battle of Kadesh with Ramses in his chariot, and the enemy pierced by arrows or trampled beneath the horse?s hooves. In the upper register are reliefs of the Festival of the god Min. This important festival was celebrated at the time of the harvest. The priests, who stand to the side of the pharaoh, await a procession headed by other priests. They carry images of the royal ancestors. Four birds are released, to carry the royal tidings to the four corners of the earth. Ramses cuts a sheaf with a sickle to present to the god Min. The terrace to the rear is approached by a stairway. 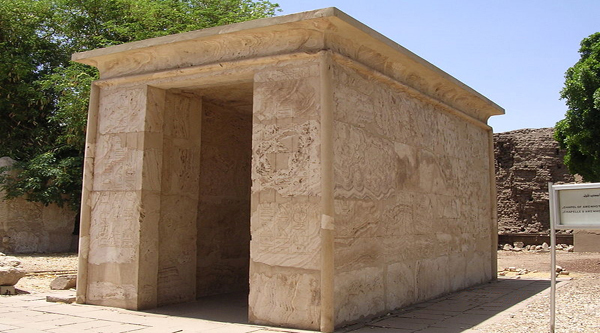 On the left-hand wall there are well preserved reliefs showing Ramses II kneeling before Amon, Mut and Khonsu. Thoth, who is behind him, records his name for eternal remembrance. To the left, the hawk-headed Montu holds the hieroglyph for life before the king's face; and Atum leads him forward. The scenes of the top register show offerings to the deities, and those on the bottom depict Ramses as a family man with many of his sons. The Hypostyle Hall has taller columns at the center with spreading calyx-capitals, and lower ones at the sides with bud capitals. The difference in height is made up of pillars with the spaces creating windows which afford light into the hall. 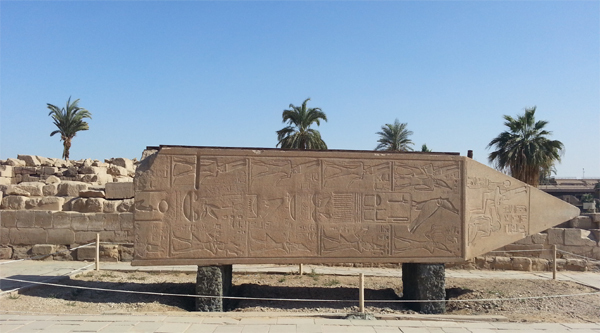 All the reliefs show Ramsess II in battle. His sons took part and proved themselves worthy of their heroic father. Each is identifiable by his name engraved beside him. 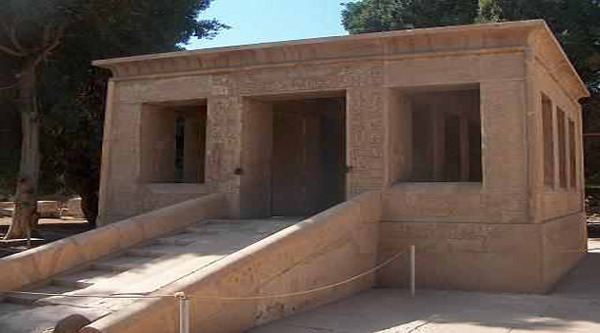 Beyond the Hypostyle hall we find two smaller halls, one behind the other. 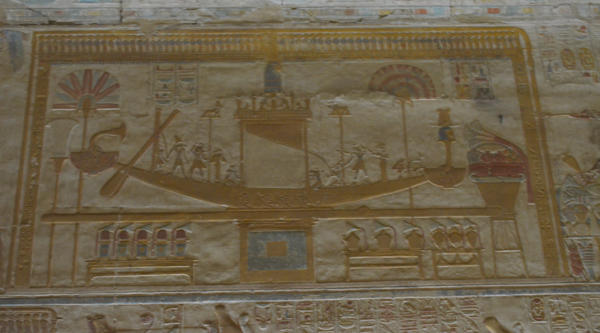 The 1st has astrological representations on the roof, and scenes of priests bearing the sacred boat of Amun, Mut and Khonsu. On the rear right hand wall Ramsess is seated beneath the sacred persea tree of Heliopolis, on the leaves of which his names are being written by the god Atum, the goddess Sheshat and Thoth. The 2nd hall is mostly in ruins. It has some sacrificial representations that include a scene of Ramses burning incense to Ptah and Sakhmet. 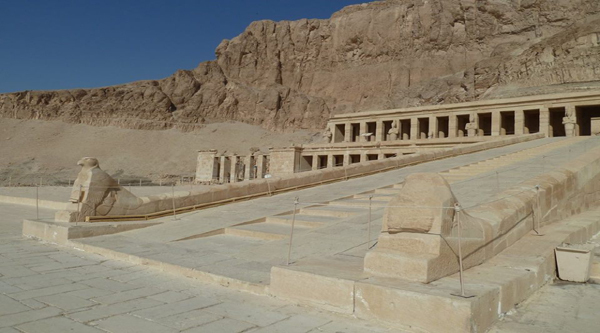 The mortuary temple was surrounded by store-rooms and priestly chambers and there was a palace complex to the south where Ramses watched the work being executed. A large quantity of ostraca found at the site has led scholars to suggest that a scribal school or library was located here, as mentioned by the Greek historian Diodorus Siculus.